This recipe is from January 2012 Cooking Light magazine. The dressing on the salad has a real kick from the adobe sauce. 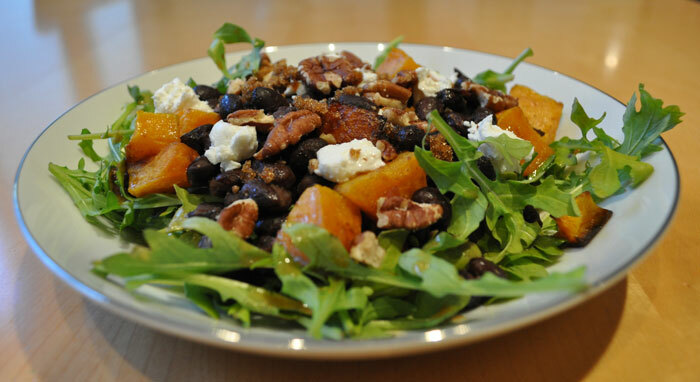 It is nicely balanced by the sweet butternut squash and nuts. Preheat oven to 425°. Combine squash and 1 tablespoon oil; toss to coat. Arrange squash on a baking pan. Bake at 425° for 25 minutes or until tender. Heat a medium nonstick skillet over medium heat. Add remaining 1 tsp oil to pan; swirl to coat. Add garlic; sauté 1 minute. Add squash, remaining 3/8 teaspoon salt, pepper, and beans; cook 3 minutes or until heated through. Remove from heat; stir in 3 tablespoons adobo dressing; toss to coat.